JFreeChart's library contains two levels of architecture to define the interaction between its various classes. 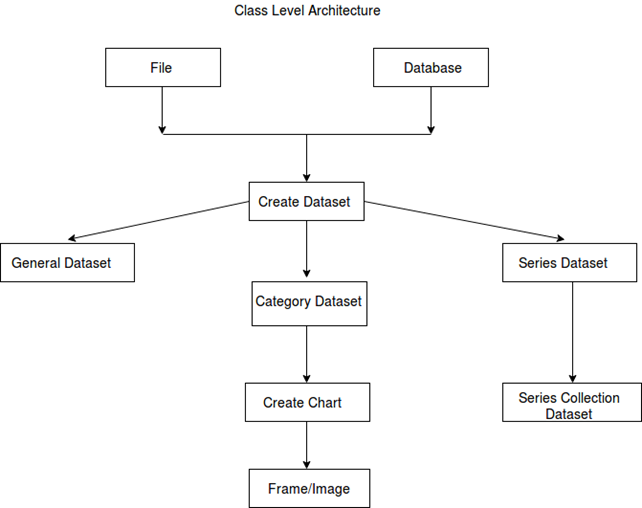 The basic Class Level Architecture represents how various classes present in JFreeChart library interact with each other to yield various types of charts. The File represents the user input used for creating a dataset in the file. The Database represents the source having user input used for creating a dataset in the database. The Create Dataset represents the dataset which is being created and stored into the object. The General Dataset is a type of dataset which is used to create pie charts. The Category Dataset is a type of dataset which is widely used for bar chart, line chart etc. The Series Dataset is a type of dataset which is used for storing series of data and construct line charts. The Series Collection Dataset represents the various categories of series datasets that are added to Series Collection Dataset. This type of dataset is used for XYLine Charts. The Create Chart is the method which is executed to create final chart. The Frame/Image represents that the chart is displayed on a Swing Frame or an image is created. The Application Level Architecture shows the location of JFreeChart library in a java application. User data is received by the client program. Standard Java and JFreeChart APIs are used to generate the output in the form of either a frame, which can be displayed directly inside the application or independently in the image formats such as JPEG or PNG.